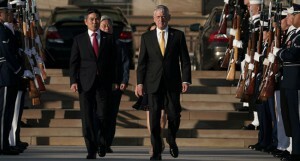 Seoul and Washington will decide in the coming weeks whether to continue suspending large-scale joint military drills, South Korea’s defence minister said Wednesday. After President Donald Trump met with North Korean leader Kim Jong Un in June, the US said it would suspend “select” exercises with South Korea, including the large-scale Ulchi Freedom Guardian exercises over the summer. The two allies this month announced they would also suspend a December drill called “Vigilant Ace” to give diplomats more time to negotiate with North Korea on its nuclear arsenal. “We will make our final decision on any major exercises (that could happen) in the next year before the first of December,” Jeong said. US and South Korean forces have been training together for years, and routinely rehearse everything from beach landings to an invasion from the North, or even “decapitation” strikes targeting the North Korean regime. Last month, then nominee to head US and UN forces in South Korea said the pause in drills had been a “prudent risk” to help facilitate a detente on the peninsula. But there “was certainly a degradation in the readiness of the force, for the combined forces,” general Robert Abrams told the Senate Armed Services Committee at his confirmation hearing. Mattis said the Pentagon is not currently concerned about a degradation in military readiness, and both he and Jeong noted that smaller-scale collaborative training was ongoing. “We are not right now concerned with a loss of combat capability,” Mattis said.